This well made creepy little horror movie was reminiscent of Rob Zombie's Lords of Salem insofar as it included witchcraft and books with secrets better left alone. But the main reason it reminded me of that film was that Pyewacket was original and personal. This wasn't a big budget horror movie with stereotypical characters. This was a throwback to older horror movies of the sixties and seventies. Instead of frenetic camera work and sensory overload this film takes its time drawing in the viewer. This allows dread and suspense to build, something that too many horror directors skip for mammary glands and immediate gore. Pyewacket, the term comes from the Salem Witch Trials, is a film that doesn't appeal to the lowest common denominator, or when it does, at least does so in an intelligent and offbeat manner. Pyewacket makes a strong nod to H.P. Lovecraft's warning from his story The Case of Charles Dexter Ward, "Do not call up that which you can't put down". People can get themselves and others in a lot of trouble when they employ tools or devices that are beyond their ability to control. We see those problems in real life when kids leave gas stoves on or find improperly secured guns in their home. 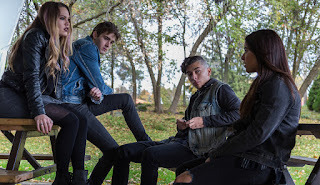 Pyewacket asks what happens when the same neglect occurs when the tools are supernatural--or at least if the people think the tools are supernatural. Unlike many of these movies Pyewacket makes the primary protagonist less than appealing. I thought she was downright unsympathetic. Leah (Nicole Munoz) lives with her widowed mother (Laurie Holden from The Walking Dead). Both Leah and her Mom are dealing with their father/husband's death differently. The mother has become a bit more acerbic in her discussions with Leah; Leah only wants to hang out with her Goth friends whom her mother dismisses as "losers". IIRC Leah's father's cause of death was unstated but it's pretty clear that Leah at least in part blames her mother. Leah's mother is impolitic enough to tell Leah during one of their frequent arguments that Leah looks too much like her father. Her mother can't stand it. She apologizes but the damage is done. When her mother decides that the two of them are going to move, separating Leah from her friends, Leah says to herself that that's it. She decides that the time has come to cast a spell that will cause her mother's death. Yeah. Leah thinks her relationship with her mother is that bad, though as we see Leah later is an impulsive sort. Pyewacket is very smart in how it mixes the supernatural with the prosaic every day resentments between a grieving mother and daughter. MacDonald doesn't overdo the special effects or blood and guts. This is as much a psychological horror movie as a supernatural one. When strange things start to happen in their new rural home, Leah doesn't want to believe it. She's not sure of what she's seeing. As her mother shows a different more sympathetic side to Leah, Leah has a change of heart about her intentions for her Mom. But it might be too late. Pyewacket makes the woods a very spooky place, particularly at night. Pyewacket doesn't explain very much of what takes place, which makes it even more interesting and scary for the viewer. MacDonald uses a slow steady buildup that leaves both the viewer and Leah questioning what they saw and what is real. The viewer could even be uncertain of what happened even after the credits run. Leah's friend Janice (Chloe Rose), a cynic, sees something in Leah's house that makes her lock herself in the car and demand to be taken home. This is unexplained. The film doesn't announce "BE SCARED NOW" through use of jump cuts or dramatic music, which makes it even more unusual for the modern horror film. If you're looking for something unsettling and different then you might want to see this. The camera work was very close and often handheld.